Many employees continue to work in the extra hours from their home either on the weekends or stretch daily hours. Some shift to a flexible working environment when not provided with a proper work space. Thus, working from home has become common for people who are working part-time or even full-time for a firm. Many employees need to use their personal laptops to check their emails or use their own phones to make work calls. But if you continue to work from home for a longer period, it is better you have your own home office. This can help you to focus on your work and calculate your work hours for better pay. Also, this can help you claim tax deductions for your home office. If you are among the one who has set up a home office in your spare bedroom or study room already, you should be aware of the tax deductions you can claim for your 2018 tax returns. We are here to help you out by providing a list of the home office expenses you can and cannot claim. The information provided below gives you a clear picture of what purchases you can claim your tax deductions. Check How You Can Claim The Tax Deductions For Home Office During Tax Time. Devaluation of the Computers and Equipment in your Office: If you utilize the equipment or any pieces of technology such as computers, printers, phones, tablets, laptops in your home office, you can devalue their cost for their life. Later, you can claim deduction every year for these items. Devaluation Of Home Office Other Equipment’s: If your home office possesses pieces of furniture like cupboards, shelves, and desks, you can claim the deduction for their declined values. You can claim the deduction for several years. Cooling, Heating & Light Bills: It is a necessity to have heaters to keep you warm during winters and coolers/AC during summers at your home office. This accumulates the total light bill you will have to pay. And you can claim a proportion of the household utility bills that you can relate to the time you spend in your home office. Occupancy Expenses: These expenses are relevant to only those who are using their home as a workplace. 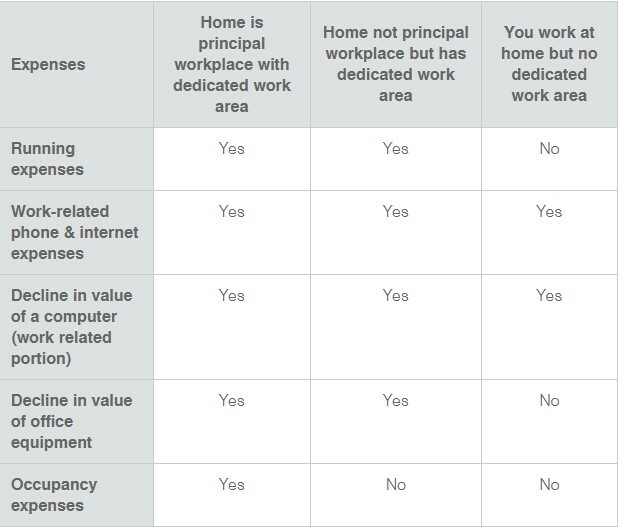 However, if your employer does not have a work space to provide you, you can provide a proof that you work from your own home office. Thus, you claim the relative proportion of the total occupancy expenses of your home office. A better way to calculate the occupancy expenses is to measure the floor area of your room in comparison to the entire home. Suppose, your home office takes 10% of your home, you can claim the exact amount for your occupancy expenses. These expenses include the rent, house insurance, interest rates, and the mortgage rates. Other Items: Make sure that you claim tax deductions for the other work-related item costs like the logistics, phone and internet costs, computer consumables (cables, printer ink, etc) and the cleaning costs. If you are work from home and if you try claiming some percentage of the interest on your mortgage or the rent, it shall be unconsidered as a claim. Generally, it is only possible if you have a room for your home office. 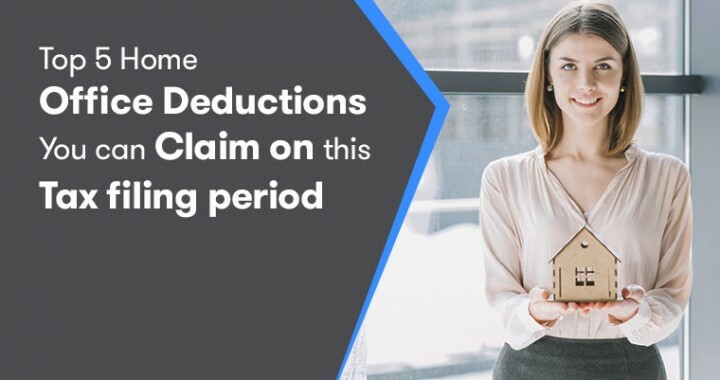 Also, if you use the room for dual purpose or as a sharing work space, then you are eligible to claim the expenses on the basis of the hours you have worked. How Much Can You Claim: As such, there is no maximum amount that can you claim. However, the amount you claim for should be calculated as per the tax rules and regulations. How Can You Make Your Claim For The Tax Deductions: Ideally, you should have a home office and a specific room for that. And you should follow the rules for claiming the tax deductions for this year. ATO Rate/Hour Method: As per this method, you need to keep a record of the total number of hours you spend in your home office. And just multiply it by the fixed rate of 45 cents/hour. You can also include the expenses such as cooling, heating, lighting and the decline costs of your home office furniture. Diary Method: This is the general method for calculating the running expenses and keeping a track of the daily activities that cost you. The diary should have every detail of the time you spend in your home office. We recommend you to keep a track of the expenses for a period of four weeks. This method is effectively useful for claiming the larger deductions perhaps you have to maintain records precisely. You also have to work around on how big your home office space is in comparison to the other rooms of the house. This can help you to calculate the amount and divide your domestic and business costs. Note: It is common that some people might have insufficient tax deduction claiming documentation. Due to this, they might not have a proper record for splitting the costs for personal and business use. It is wise to use any one of the two mentioned methods. It is never too late to claim your tax deductions this year. Make stringent records of your daily costs and work hours for precise claims. ← What Is The Tax File Number?